James Comey, the former Deputy Attorney General who famously stood up to the administration's warrantless wire-tapping policies is back in the news because he is about to be appointed Director of the FBI. His back-story is also relevant as US domestic intelligence collection policies are in the news. A quick re-cap, when Jack Goldsmith took over the Office of Legal Counsel at DOJ he tossed out the previous opinion that authorized the administration's domestic intelligence collection. He persuaded Comey that the opinion authored by his predecessor and used as legal support for the adminstration's domestic intelligence collection policies was not legally sound. One aspect of the program was that it had to be re-authorized by the Secretary of Defense, the Attorney General, and the Director of Central Intelligence every 45 days. Comey, acting in Ashcroft's stead during the Attorney General's hospitalization, refused to re-authorize the program. This led to the infamous hospital scene in which White House chief of staff Andrew Card and White House Counsel Alfredo Gonzales went to Ashcroft's hospital room to get him to sign and had a confrontation with Comey. Comey took the issue to the President, warning him that appointees at the Department of Justice would resign en masse if the program were continued. The President, who reportedly did not know the extent of DOJ's dissatisfaction with the situation, altered the program. This story is generally taken as yet another case of Cheney's nefarious influence. Cheney's support of the intelligence gathering policy is not in dispute and apparently there was little love lost between Cheney and Comey. But was Cheney really in the driver's seat? I think there is another way to view the incident - not as a matter the facts, but rather the interpretation. First, the episode occurred in 2004. Bush's priority would have been on his re-election campaign. He told his vice president to keep things off of his personal agenda if it all possible. Second, the program had been re-authorized 20 times without incident. From Cheney's perspective the question had to be, in effect, "What now?" Bush called the ailing Ashcroft at his hospital to press him to sign and he agreed to do so. When Bush's people arrived though Comey was there digging his heels in. It could be argued that Cheney might have served the President better by alerting him to these kinds of difficulties so that the administration could address the problems before they became a crisis. But by most accounts, Bush was not passively drawn into the extensive surveillance programs - he thought they were a good idea and was a proponent of them. So his staff was acting as his bludgeon - pushing through his preferences. So instead of Darth Cheney, architect of a surveillance program dimly understood by his callow President - we see VP Cheney doing what VPs have done since they were given a role: help the President do whatever it is the President wants to do. VPs do sometimes provide the "wait a minute" moments - telling Presidents a difficult truth that no one else can articulate. Maybe it would have been wise for Cheney to play that role (as Ford's chief of staff he sought to make sure Ford heard a range of views on key issues and ensure there was an orderly policy process.) And maybe he did that on some issues. But the President specifically tasked Cheney with ensuring there were no more attacks against the US, and Cheney took that mission to heart. The last week with the dramatic fiscal cliff negotiations should have been case study gold for this vice president obsessed PhD candidate. Biden, as all but those sensible enough to turn off the news, must know negotiated a settlement with Republican Senate Minority Leader Mitch McConnell to avoid going headfirst over the fiscal cliff. What we can say with some confidence is that the vice presidency has always been worth a good deal more than a bucket of warm piss, and that at least since Harry Truman became president in 1945 it’s been a pretty reliable steppingstone to the presidency. In the modern era vice presidents have tended to be powerful even when they didn’t become president, probably because their selection has been based less on party loyalty or geographic, demographic, or ideological balance and more on perceived aptitude and compatibility with the chief executive....Powerful veeps aren't news. Time to stop pretending that they are. A few fussy points (if I'm going to be an academic, I have to learn to be fussy.) My dissertation is about the question of influence, when the vice president effectively makes policy. Is that what happened here? Biden managed the negotiations with McConnell and reached an agreement, but was that influential or more a matter of carrying-out a difficult task? This is not to downplay Biden's role, and it is a role other VPs have played in the past. Gore negotiated all kinds of difficult issues with Russia, Ukraine, and South Africa - but he was effectively carrying out policy, not making (there were cases where he pushed for policies within the White House and he was often successful.) Mondale handled sensitive issues with the Senate on Carter's behalf, most notably the Panama Canal Treaty. But the Treaty was Carter's idea, Mondale just helped make it happen. On many other issues, it appears that Biden has been influential, but as important as his role was, I'm not sure if it is necessarily influence. I have observed before that age may be an indicator in President-VP relationships. The strongest relationships were between virtual contemporaries. Carter is four years older than Mondale, while Clinton is two years older than Gore. Reagan, on the other hand, was 13 years older than Bush, while Bush was 23 years older than Quayle. I am working on some analytical methods of rating vice presidential influence, but eyeballing it would make it appear that the closer the President and Vice President are in age, the more likely the vice president is to exercise influence. Mondale and Gore were pretty influential, Bush Sr. less so, and Quayle's influence was limited. But what about a case in which the VP is older? Cheney is five years older than Bush 43 and Biden is 19 years older than Obama. These two figures are also towards the top of the scale in vice presidential influence. Of course there are other variables. Obama was one of the least experienced President's in modern history. Bush 43 was much more experienced and had very little background in foreign affairs, which quickly became central to his administration. Bush Sr, while younger than Reagan, was extremely experienced but faced internal opposition from Reagan loyalists. There are obviously other factors determining vice presidential influence. But still, the trend is intriging. 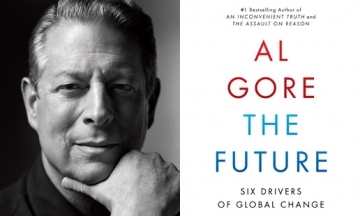 Sunday morning I caught Al Gore on Fareed Zakaria GPS hawking his new book - The Future: Six Drivers of Global Change. He will be 68 years old in 2016 - he could make another run for the Presidency. I don't think he will. He is having a good time writing books (his first career, before politics was as a journalist) and making lots of money. Being a politician is not all its cracked up to be, the truth is being a journalist is more fun. His split from Tipper and the sale of Current TV to al-Jazeera might be fodder for the opposition. Plus, campaigning is hard work and by most accounts Gore did not love it - not the way Clinton did. And running brings with it the risk of losing - one can easily imagine that Gore is not ready to go through that again. Finally, politics can be like TV - the people want a new face. This goes for many leading political figures. Gore has been on the national stage since his first run for the Presidency in 1988 (25 years ago). This also applies to some other likely candidates. Hillary, in this regard, suffers from her association with her husband - we've now had 20 years of Clintons on the national stage. Biden first entered the Senate in 1973 and ran for President in 1988. Jeb Bush, on the Republican side, suffers similarly. After two Presidents Bush and a Bush in national office for 20 of the past 32 years there is no particular hunger for another President Bush. The irony is that these well-established figures often have the resources needed to win the nomination, but then can't win the general election against a fresh face. None of this by the way is a comment on the merits of a any of these figures as a potential President. But still, it is an intriguing possibility. If, for whatever reason, Hillary and Biden opt out and none of the Democratic party's 2nd team gets traction in the 2016 primaries, is a draft Gore initiative out of the question? He remains and impressive, engaging figure who brings up issues that resonate with much of the party's base. And Gore has the intriguing quality of "what might have been" had things in 2000 gone just a little differently.